Andrew Gelman argues, based on “extrapolation from preferences of the top 5%, data on campaign contributions, and data on political attitudes of the top third of income,” that “there are lots more rich and powerful Republicans” than Democrats. While extrapolation from the top third, or even the top 5%, to the “super-rich” seems perilous, some new data on campaign contributions handsomely support his claim. Stanford political scientist Adam Bonica has done terrific work mining public campaign donation records for insights into the behavior of campaign contributors. Using a scaling algorithm similar in flavor to those often applied to congressional roll call votes, he has mapped more than 50,000 candidates for federal and state offices and more than 11 million distinct campaign contributors on a “liberal-conservative” dimension. Among Bonica’s millions of contributors, he has recorded $460 million in contributions from 377 of the Forbes 400 richest Americans. 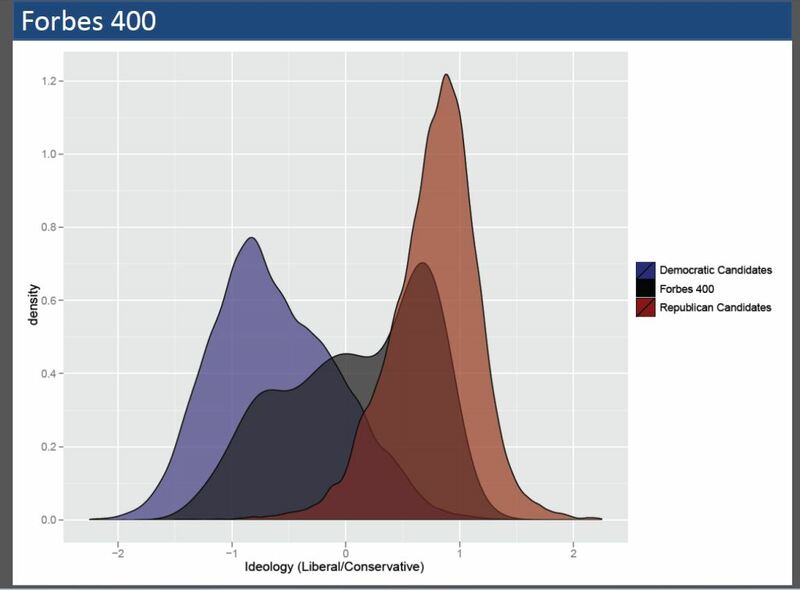 In a presentation at Stanford earlier this month, he compared the ideological distribution of his Forbes 377 to the distributions of Democratic and Republican candidates. The (dark grey) distribution of super-rich contributors has three clear modes. The most numerous sub-group overlaps the distribution of Republican candidates (though mostly not the most extreme conservative Republican candidates). The least numerous—but still appreciable—sub-group overlaps the distribution of Democratic candidates (though mostly not the most extreme liberal Democratic candidates). The middle sub-group consists of people who made significant contributions to both Democrats and Republicans. For what it’s worth, I suspect that Andrew is mostly right on this score as well—but also that there is a great deal of politically significant variation even within the domain of “economic policy.” For example, the finance industry super-rich in Bonica’s data look, on average, much like the rest of the super-rich. However, even those who contribute mostly or entirely to Democrats are probably not “moderate” on the issue of financial regulation—a fact that may be relevant to understanding why the regulatory response to the Wall Street meltdown was not more vigorous.